» Pending bills: End daylight time? Pending bills: End daylight time? The Capitol on a spring day: Wouldn’t more daylight after work be nice? Of all the bills introduced in the 2015 Oregon Legislature, my favorite so far is Senate Bill 99. 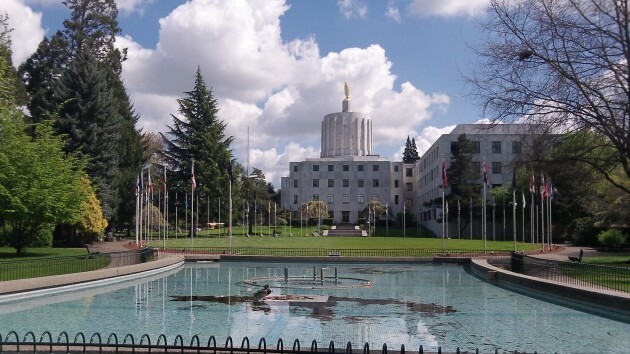 It would take Oregon out of daylight saving time starting in 2021 if the voters approve in the 2016 general election. Sen. Kim Thatcher, R-Keizer, introduced the bill at the request of a constituent named Gene McIntyre. Bills requested by individual voters typically get nowhere, and I have no idea whether this one will be an exception. But if it does get traction. amendments would help. Why not do the opposite, that is, keep daylight saving time in effect year-round? The benefits would be greater, in terms of after-work activities while the sun is still up. And why wait until 2021 to make a change? Why not do so right away, starting this year or in 2016? SB 99 stands out among the pending bills because it tries to fix an actual problem, the disruption in people’s lives caused by the needless time change twice a year. That’s what makes the bill unusual. But it is not the only one among the first 99 Senate bills that is worth noting. For example, two measures sponsored by Sen. Rod Monroe, D-Portland, would allow local government to impose taxes on alcohol and tobacco. Think of all the local budget debates that this would entail. Another proposal by Monroe would authorize sobriety checkpoints, in which police stop all drivers to see if any had something to drink. It would be annoying to be stopped, but not nearly as annoying as being killed by somebody driving drunk. Senate Bill 16 would allow juries to be informed of minimum required sentences before they reach a verdict, which might prevent some unnecessarily severe sentences. If you want an extra hour of daylight for summer evenings just make arrangements to come in an hour early. Essentially that is what is being done when the clocks are moved ahead for daylight saving. I am in favor of eliminating DST. I want more daylight in early morning, so do parents with school children, so do farmers, and many industries in Oregon. Safety comes with daylight! Besides, earlier darkness in spring and summer makes it easier to go to sleep at a decent hour. No DST! The sooner the better. I also support this Hasso. I expect it would mean I would be awake to watch the Tonight Show at 10:00 for half the year. But really, there is no need in today’s age to continue the practice of DST.